Home » Sports Talk » Tough Week for Boston Sports Fans….Ya Think? Tough Week for Boston Sports Fans….Ya Think? Anyone not on any Boston or New England sports bandwagon is either laughing beer out of their upturned noses or actually taking a bit of pity. Boston has enjoyed pinnacles of sporting success over the last decade or so and Bostonians are not shy about sharing what may be considered over exuberance by our fellow sports fans in other cities or even countries. I get this, we live close to New York and in New York live equally loud fans called, well, New Yorkers, enough said. Bruins Lose in what we can all agree was a fantastic Stanley Cup playoff series but in 17 seconds? What just happened? Aaron Hernandez is exposed as the epitome of thuggery (allegedly) and suspected in a murder 2 football fields from his house. 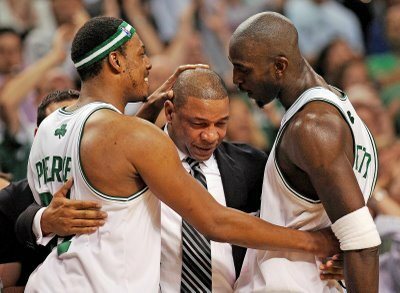 Doc Rivers goes to the Clippers…..the Clippers? Really? The ones in Los Angeles? 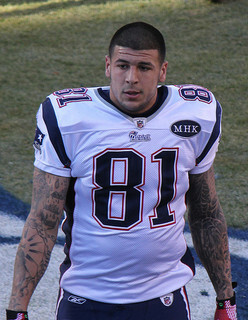 Aaron Hernandez now being investigated in yet another homicide or 2, this one 2 years on the books. Kevin Garnett and Paul Pierce are packed and gone to the Brooklyn Nets….I still haven’t digested this one. It will likely be caught in my bowel for quite some time. What’s next? Bobby Orr is on a plane to Moscow with 4 lap-tops full of Bruins playbooks? Give a city a break, a hug, something! For the love of everything holy bring us a casserole or plate of brownies to help us get through these trying times. New York, Chicago, hell, I’ll take pity from Vancouver at this point! Cry with us, share our tears and tell us it will be alright! It will be…..right? Hello? Forget it! Keep your pity. We always get through it. If we’re not dooming and glooming we are boasting and gloating and the light at the end of this hellish tunnel is hopefully not another runaway train heading this way. Bye bye Doc, thanks for the memories. K.G. and Paul, we knew ya when and understand, this is a business. Aaron, you were given every opportunity on the biggest proverbial silver platter possible. A court and likely a jury of your peers will tell you if you indeed squandered your chances of being a decent human being and an exceptionally gifted athlete. Boston survives as usual and as always we do enjoy our rivalries and look forward to next year, and this week and every chance of meeting on the field, court or diamond of battle. Let me guess, you are from Boston and they call you Fitzy? Well, Fitzy, you are spot on. WTF happened in the past week? Let’s take solace in the fact that. . . . f-that . . .nothing to cheer about in Beantown sports this week. How about a beer? I’m sorry, but I laughed out loud. Love your sense of humor in a difficult time.